Take your homemade brownies to the next level with this delicious recipe for coconut topped brownies. The coconut topping caramelizes in the oven for the perfect sweet addition to brownies. There is no better way to deal with stress than baking these coconut topped brownies. At least I find baking to be incredibly therapeutic, even more so than actually eating the desserts. So if you want to know a little secret, I’m a little in over my head at the moment, but as a college student, I mean, who isn’t? Want to know another secret? Today, I’ve eaten more chocolate chips than anything else. I don’t think my nutrition professor would be very pleased with me. Oh well, my mind is happy and soothed. It’s the little things in life, right? You know something that is not a secret? My love for brownies. Seriously, I love them. If brownies were an animal, they would definitely be my spirit animal. Does anyone else remember that spirit animal phase from The O.C? AKA, the time when Summer went to Brown, slightly lost her mind, and then when Seth visits he discovers that his spirit animal is an Otter. This phase of The OC is also remembered, not too fondly, as the steep, downhill, turn for the worst ending of a one time fabulous show. Why am I talking about spirit animals? Really when it comes down to it, I love all brownies, even the gluten-free variety, they are so forgiving. Now this recipe for coconut topped brownies is kind of the ultimate brownie in my mind. They are perfectly fudgey and topped with a simple coconut topping which caramelizes in the oven – hello heaven! Do you love the taste of caramelized coconut? My mom makes a coconut topping for banana bread which is where I got this idea. Plus the combination of chocolate and coconut is just perfect, don’t you think? 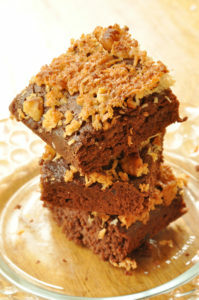 While I do love to share healthy recipes, sometimes, all you need is a good brownie, or three. If you’re in the mood for some healthy talk, check out my most recent posts on The Kit, but if you’re having a day where brownies are required, please make these. Preheat oven to 350 and line a 9x13 inch pan with parchment paper. Melt chocolate and butter in a bowl over a pot of simmering water. Set aside and allow to cool. Meanwhile, in a small bowl, whisk together applesauce, eggs and vanilla. In a large bowl, whisk sugar, flour, cocoa powder and baking powder together. Stir in the liquid ingredients. Finally mix in the cooled, melted chocolate. Pour batter into the lined pan. Prepare the topping by mixing the coconut, melted butter, chopped walnuts and brown sugar together. Evenly spoon on top of brownies. Bake in the oven for 25-30 minutes. Lastly, place the brownies for 1-2 minutes under the broiler, or until topping is caramelized. Please enjoy these coconut topped brownies, I’m going to find out what my real spirit animal is. Can't wait to make these....my two favorites, chocolate and coconut!!! And when I was thinking brownies can't get any better! Love this coconut topped ones! Delicious! my word you just took brownies to a whole other level!! !